LM: IL PAPA CHE PAGA IL CONTO IN HOTEL, LA FOTO FA IL GIRO DEL WEB. GRANDE GESTO DI UMILTA' !! 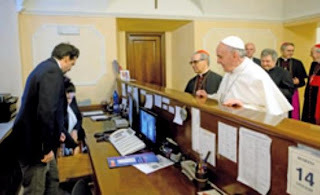 IL PAPA CHE PAGA IL CONTO IN HOTEL, LA FOTO FA IL GIRO DEL WEB. GRANDE GESTO DI UMILTA' ! !